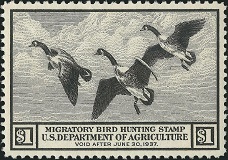 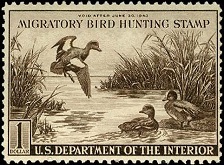 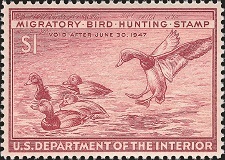 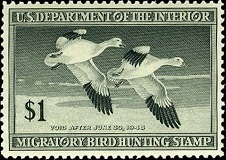 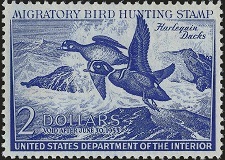 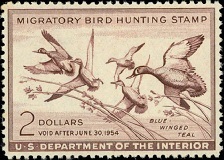 Migratory bird hunting stamps have been issued every year since 1934. 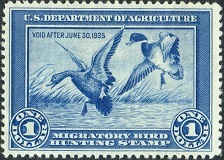 The stamps issued between 1934 and 1938 were inscribed US DEPARTMENT OF AGRICULTURE, and the stamps issued since 1939 have all been inscribed US DEPARTMENT OF THE INTERIOR. 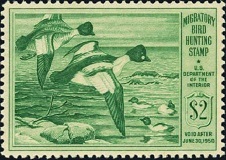 The proceeds from the sale of these stamps benefit Waterfowl Conservation and Waterfowl Habitat Conservation. 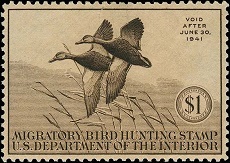 These stamps are issued at the beginning of July of each year, and they are valid for use on bird hunting permits through June 30 of the following year. 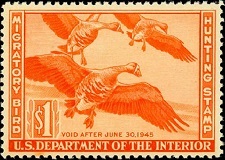 The expiration date is inscribed on each of the stamps, thus, the stamp issued in 1934 is inscribed VOID AFTER JUNE 30, 1935. 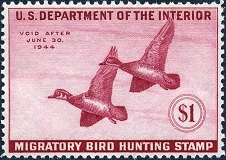 In order to be valid, the stamp must be affixed to each year's bird hunting permit and signed by the holder of the permit. 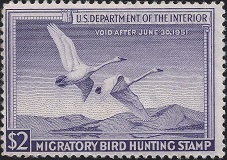 Thus, used stamps have manuscript cancellations. 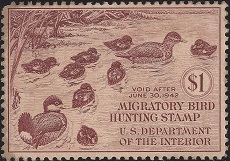 These stamps are sold through the United States Post Office, and as such, stamp collectors can also buy and keep mint condition examples for their collections. 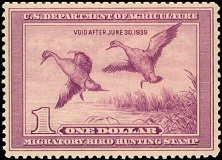 These stamps are NOT just collected by US revenue stamp collectors. 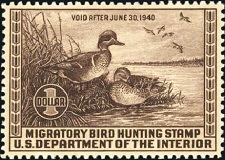 They also have a worldwide appeal to thematic collectors, hunters, bird enthusiasts, and the general public. 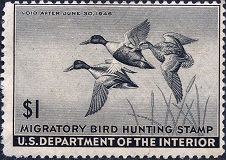 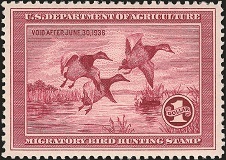 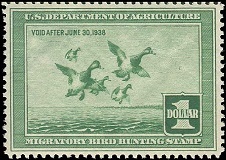 Due to the high demand for these migratory bird hunting permit stamps, sometimes called "duck stamps", many of the earlier issues have become scarce and very expensive. 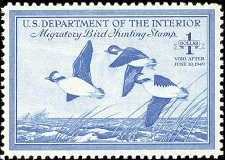 The collecting of migratory bird hunting stamps may also include errors, plate blocks, proofs, artist signed prints, and more recently, decorative miniature panes. 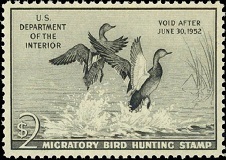 In order to maximize the subject content of this section, the stamps of this period are shown in table format, with a brief catalog detail description and a description of the vignette below each of the images.